Tatogga Lake, British Columbia – We’ve been traveling for four days and have finally arrived at our destination: Tatogga Lake. Tomorrow, we’ll be traveling by helicopter to our field site. It’s the first helicopter ride for most of us and we’re pretty excited about the birds-eye view of our subglacial pillow ridge (not to mention the gorgeous scenery). Although we’re eager to get started on our research goals, we’ve enjoyed the journey. In Wells Gray Provincial Park, we saw some of the most beautiful waterfalls and glaciovolcanic features. On the drive, we visited the world’s largest fly rod. I think our bear spotting count is up to at least 9 now. The best is yet to come, and we hope to have some fantastic photos to share with you when we come out of the field sometime next week. Until then, we’ll be off the grid, happily geologizing! Most of the crew at Spahats Falls in Wells Gray Provincial Park. 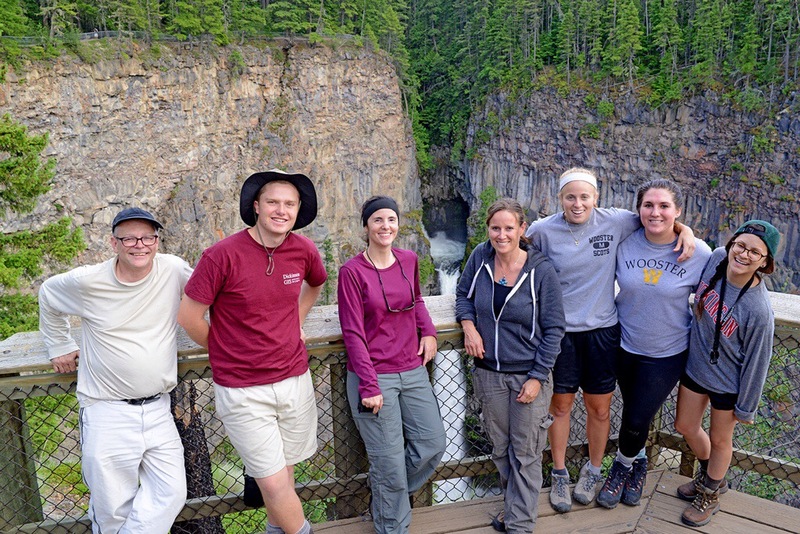 From left to right: Dr. John Greenough (UBC Okanagan – not part of the pillow team, but conducting research in Wells Gray), Will Kochitzky (Dickinson), Dr. Meagen Pollock, Erica (Dr. Greenough’s grad student), Julia Franceschi (Wooster), Mary Reinthal (Wooster), and Liz. Placenscia (Dickinson). Not pictured: Dr. Ben Edwards, to whom the photo credit belongs. Good luck, Team Canada! I’m no longer teasing about Lava Bears.